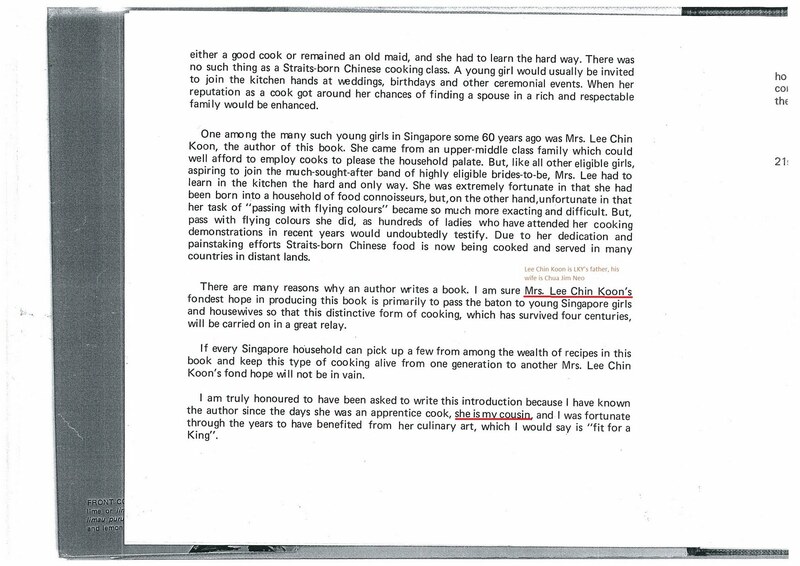 LKY's mother Chua Jim Neo wrote a book by the title Mrs Lee's Cookbook somewhere in mid 1970s. 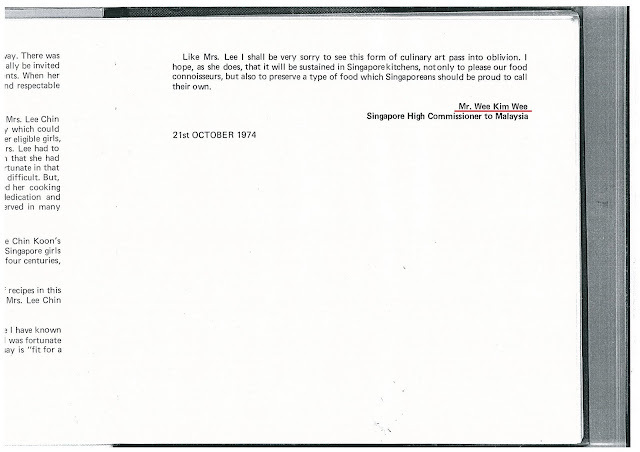 Wee Kim Wee who was then the high commissioner to Malaysia wrote the preface of the book, addressing her as "cousin". (Click the attachment below for clearer view). The preface was mysteriously removed from the later publications. Wee was born to Wee Choong Lay and his wife Chua Hay Luan. 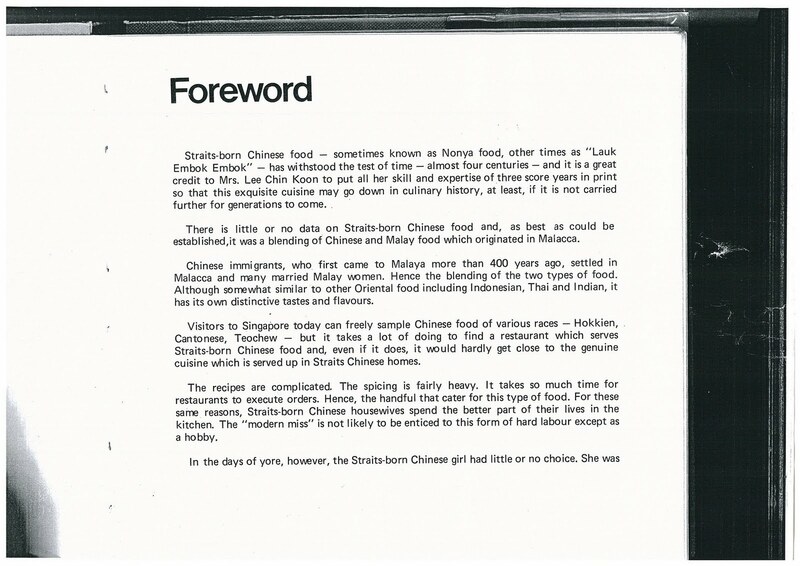 Wee Choong Lay came from a poorer branch of a rich family. He was a ship purser but was blind when Wee Kim Wee was six years old. Chua Hay Luan is likely to be the aunt of Mrs Lee Chin Koon nee Chua Jim Neo, LKY's mother. Chua had to take on menial jobs to support the family, after her husband was incapacitated. Her cousin Chua Keng Bin, gave them S$10 a month. The family moved into a rented house in Holland Road and subsisted on poultry and fruit trees that were grown in the home's compound. 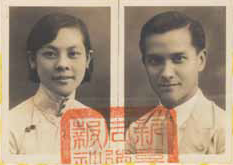 Wee attended Pearl's Hill School, Outram School and Raffles Institution but halted his education in 1929, at the age of 15, to supplement his family income through work. Finally, Wee lost his father when he was only eight and his mother when he was 19. Wee married Koh Sok Hiong, a very remarkable woman in my opinion. She loved Chinese culture and forced her children to learn Chinese. Wee worked in the press and served as high commissioner since 1973, and was made president of Singapore in 1985. This is fascinating. You're doing a great job. in unraveling the nepotism at work here. Although I love Wee Kim Wee as our President very much (have met him personally) and a genuinely loving person, I am now also determined not to vote in another one of Lee's family - ie. Tony Tan. They have just lost any credibility if/when they try to sue anyone for defamation or libel suits on nepotism, because the facts speak for itself. Fantastic piece of investigative writing. Keep it up! Looking forward to more revelations. The latest NUS alumNUS magazine said Mr. Tan Jiak Kim is the great grandfather of Tony Tan. Are you able to provide more on the family tree of Tan's? Heavily guarded Fort canning reservoir spring water is supply to the dictator, we slave drink new water. That is the only reservoir in the island that needs to fenced up. All his cronies are related to him, if not close buddies. One of the comments above that asked if Jiak Kim is TT's great-grandfather got me interested and after a great deal, I've found out that yes, he is!